German Dramatists, Freemasons, Poets, and Romanticists. As an Actor and Freemason I have a great love for dramatic and philosophical literature. I was compelled to learn how Freemasonry contributed to the dramatic works of Johann Wolfgang von Goethe, Gotthold Ephraim Lessing, and Friedrich von Schiller. These three Freemasons wrote in Germany where Romanticism began as a literary movement. To understand political power alright, and derive it from its original, we must consider what state all men are naturally in, and that is a state of perfect freedom to order their actions and dispose of their possessions and persons as they think fit." Perhaps the declaration of Independence can not be called a Freemasonic document, but I believe that the Constitution certainly can. Michael Baigent and Richard Leigh in The Temple and The Lodge remind us that "the Constitution was a product of many minds and many hands, not all of them Freemasonic. The prose of the document itself was Thomas Jefferson's, and he, though sometimes claimed to have been a Freemason, was probably not. But there were ultimately five dominant and guiding spirits behind the Constitution - Washington, Franklin, Randolph, Jefferson, and John Adams. Of these, the first three were not only active Freemasons, but men who took their Freemasonry extremely seriously - men who subscribed fervently to its ideals, whose entire orientation had been shaped and conditioned by it." "The justice of aristocratic birthright was called to question by a rising middle class. They began to trace the development of these unfair political and social structures and, in doing so, tented to idealize primitive society. Primitive man, who was equal to his peers and free to follow the dictates of his own conscience, seemed the ideal." Freemasonry has and remains to be a place where men of different backgrounds join in brotherly love. Kings, actors, Presidents, scientist, theologians, servants, etc. are all equal in the Masonic Lodge. 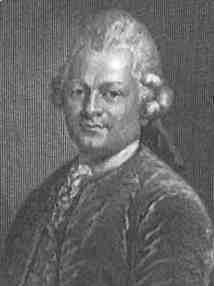 Gotthold Ephraim Lessing was born at Kaumitz, in the Neiderlausetz, January 22, 1729. In 1746 Lessing moved to Leipzig to attend University. Lessing was the son of a theologian and was expected to follow in his father's footsteps. "In 1746 Lessing moved to Leipzig to attend University there. It was here that he began to expand his intellectual horizons and to explore areas outside theology. His mind soon became free from the restraints of home and he began to dabble in theatre...acting and writing. It was here that he began to see truth in popular literature, in art, in philosophy, in the history of Europe and the Middle East, and, even in mathematics. His interest in these subjects drew him into the company of a wider social world and the people of those disciplines soon became his compatriots and friends. Among them he received encouragement to write for the theatre and to abandon theology. He seems to have learned that truth was to be found in many places and that God would use the full talents of those he created to reveal and manifest truth. Lessing was initiated in a Lodge at Hamburg and was made a Master Mason on October 14, 1770. Freemasonry does not require adherence to any particular religion, only a belief in God. This was not the case for Lessing in Germany (and France) where Jews were denied admission because of their religion. In England "in 1723 the Reverend James Anderson, acting on instructions of the Grand Master of England drew up his now famous The Constitutions of the Freemason, to guide the revival of the order in that country. Anderson was well aware that religious differences had convulsed England a few decades ago, and so he wanted to create a plateau of peace where all men might unite as brothers before the sacred altar of the Fraternity." Frederick the Great was the Grand Master in Prussia, and many German men became Freemasons because of this monarch. Lessing had a very important job as librarian of the Duke of Braunschweig which he could not afford to lose. He had suffered many months of financial hardship before this job. Lessing had a very dear Jewish friend named Moses Mendelssohn who was very hurt by Lessing's membership in Freemasonry. Mendelssohn stated that Lessing had "new truths that he could not share with an old friend. Lessing knew that Mendelssohn had a right to an answer, but the question was how?" Lessing wrote some harsh criticisms of what he saw as hypocritical in an order that proclaimed brotherly love. Lessing did not lose his job but was ordered by the Duke of Braunschweig not to publish anything more that was controversial in nature. "As a dramatist, Lessing hit on the idea of using the stage to correct the raw injustice in German lodges and to teach German brothers something that they should have already learned. The result was two works: Ernst and Falk, his famous essay about Freemasonry, and Nathan the Wise, a drama that is now known world-wide as his great plea for religious tolerance." Lessing's first work deals with the reasons why one man becomes a Mason. "The two characters are Falk (Lessing), a sharp and sceptical Mason, and Ernst, an inquiring young friend. Ernst is eager to learn as much as possible about the order, but Falk repeatedly responds to his friend's queries in an elliptical manner, which leaves him more confused than ever. Thus, to Ernst's straightforward question whether he is a member, Falk replies: "I believe that I am." This evasive answer is incomprehensible to Ernst, for whom membership in the order is simply a question of fact, and Falk is forced to clarify his meaning. "I believe that I am a Freemason, not so much because I comprehend and know, what and why freemasonry is, when and where it has been, how and by what means it is advanced or hindered." Here Lessing speaks to the Mason who simply joins the order but never searches for more enlightenment through Masonic history and it's great thinkers. Lessings theory that Freemasonry evolved from the Knights Templar in the fourteenth century was rejected many years ago. Today Baigent and Leigh's work are evidence that Lessing's theory is very much alive in many historical and Freemasonic circles. Nathan the Wise is more about the meaning of a Mason's obligation. In this play Nathan is a Jewish merchant who is summoned by the Sultan Saladin who wants him to make a choice between Christianity, Mohamadism, and Judaism. Nathan is really Lessing's beloved friend Mendelssohn. Nathan realizes that the Sultan wants him to choose one religion as the greatest religion and instead tells the "Parable of the Three Rings." The father in this parable has a beautiful gold ring that he wants to pass on. The problem is that he has three sons. A goldsmith is able to duplicate two other rings so that even the father can not tell which is the original ring. The sons fight over who has the "true ring" and bring their problem to a famous judge for his decision. The judge in this parable is the Master Mason and he is unable to choose. "I understand that the owner of the true ring is loved by his fellow men. Which one of you three do the others love best?" The sons realize that they all must have the false ring because all of them loved themselves more than their brother. The judge instructs them "to go out and show through their noble acts devoted to helping mankind that they wore the original ring. In time they might return before a wiser judge who would decide the question. Lessing meant his Nathan the Wise to be a sharp reminder to all Masons that they have taken upon themselves a solemn and binding obligation to their order." - Nathan does not believe that any man should view their religion as the only road to salvation. It is interesting to note than even today Freemasonry receives the sharpest criticism from those who believe their religion/church is the only road to salvation. Although some men prefer the Lodge to organized religion, Freemasonry does not replace religion. "Nathan and Saladin may be said to be above the prejudices of their religion in the sense of the Freemason, and thus able to love men as men, they have not totally rejected their traditional faith." Lessing believes that the one true "religion" that all people should agree with is "the Masonic principle of unbiased love, prompting service for others." Than I shall sit upon it, and decide. So spake the modest judge.
" That it was always the surest indication of a healthy vigorous political constitution if it allowed Freemasonry to flourish by its side, just as it is still the infallible characteristic of a week, timorous state if it will not openly tolerate what it must tolerate in secret." Hitler did not tolerate Freemasonry. There was only one other group that Nazis and Fascists hated more than the Jews, and that was the Freemasons. Johann Wolfgang Goeth was born in Frankfurt-on-Maine on August 29, 1749. He joined Amalia Lodge in March of 1780, ten years after Lessing. Goethe had a great respect for Lessing and this could be the reason he became a Mason. 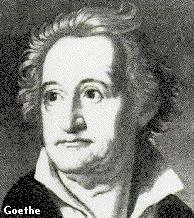 Goethe is considered to be the greatest of German poets, and is often compared to Shakespeare. So much of Goeth's writings are inspired by Masonic teachings. His novel The Society of the Tower "is evidently based on the many Freemasons' lodge which grew up in eighteenth-century Germany, and which played a not unimportant part in its social and cultural life." Goethe also wrote several Masonic poems. "Ye have, to reward you. This is a beautiful poem about the Masons immortality, journey through life, and his freedom to choose a good life. His most important Masonic work is his drama Faust. "It is a magnificent work that is probably the finest of the romantic plays." Faust is about Goethe's life, and is written at different periods of his life. Throughout the tragedy there is a struggle between good and evil just as there is in the Masonic initiatory drama. "It is here that the keen student of Freemasonry and the lover of Goethe find so many contacts between mind of the poet and teachings of the Fraternity. As in the Legend of Hiram Abif, Faust at last finds that evil may not forever strive successfully with good; his final and greatest satisfaction is not in selfish pleasure, which means death for the soul, but in work for humanity. Faust and Lessing's son's in the "Parable of the three Rings" learn that true satisfaction comes from helping humanity, and not from selfish pleasure. Faust and Hiram are not unlike either. Both overcome evil and learn that the "divine is always within humanity do we but seek far enough." Faust also learns that good will triumph over evil in the end. Soon after Mozart's (also a Freemason) operatic stage success of the Magic Flute Goethe also brings Masonic effects to his play Gross-Kaphta by combining "the subject of the 'Grand-Master' of an 'Egyptian' society on the lines of the freemasons." Goethe died on March 22, 1832. His lasts words are perhaps most telling about Goethe as a Freemason and as a writer. His last words were "More light!" 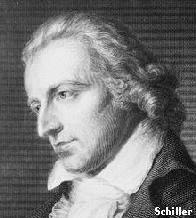 Friedrich von Schiller 1759-1805 was one of the greatest German writers, and has been said to be second only to Goethe. Thus far I have found very little about Schiller's Masonic career or any research into how Freemasonry contributed to his drama. Masons always wonder how it is that biographers can mention so little about Freemasonry. Just as Goethe may have been prompted to become a Freemason because of Lessing's love of the craft, Schiller may have joined a Lodge because of his friendship with Goethe. One poem that I found by Schiller is clearly Freemasonic. "Schiller's great dramas are alike in being tragedies or epics with historical and political backgrounds; they exemplify his idealism, high ethical principles, and insistence on freedom and nobility of spirit." Beethoven (also a Freemason) said to his biographer " I have it! I have it! Let us sing the song of the immortal Schiller!" An unfinished novel, Die Geisterseher, and the "Ode to Joy" by Schiller was used for Beethoven's Ninth Symphony. "The poem's philosophy of love and brotherhood was relevant enough to the composer as a young man in revolutionary Europe that he became a Freemason, a lodge dedicated to the ideals, and he remained a member until the organization was banned in Austria in 1795." It has been said that men such as Mozart, Beethoven, and Schiller are "famous men in which they likewise see the Masonic hand at work." Schiller has been called the "poet of freedom" "His drama Don Carlos (1787) attempted to encourage the development of freedom throughout the world.. He "gave the highest literary expression, in any language, to the ideals of the American Revolution". Schiller believed that "an actual composition does not embrace morality by lecturing it's audience on what is right, and what is wrong. Instead, Drama must develop the inner workings of the human soul, and thus empower man to act morally." I believe that this is precisely what the Masonic Ritual does for the Freemason. "Schiller wrote for the great ideas of Revolution, he destroyed the spiritual Bastille, he raised the temple of freedom, and indeed that very great temple, that should encompass all nations, just like a single community of brethren." I have certainly found that the writings of Goethe, Lessing, and Schiller were influenced by Freemasonry. More and more I see why these Romantic playwrights would have a profound interest in Freemasonry. Like the Freemason today, they looked in Masonic ritual and history for inspiration and for heroes. The romantic writings about morality were not always practiced in Europe or the new world. The same can be said about the ideals of Freemasonry. Lessing heard of equality, fraternity, and brotherhood in the Lodge, so he could not just sit by and watch Jews being denied membership in Masonry. The middle class in Europe also began to see that all the talk about equality was not a reality in their lives. When they realized this the rise of realistic theatre began to take place. Lessing did not live to see the German Freemasonry correct the error of its ways. I believe these German Dramatists would be pleased to see the success of The United States of America. She is a country founded on a romantic document that has afforded its people more freedom than any other country in the world. A freedom the Goethe, Lessing, and Schiller loved so dearly. 4. Lessings Masonic Dialogues (The Masonic Book Club, Bloomington, Illinois 1991) p. ix. 11. Lessings Masonic Dialogues p. xi.